Take a look at two cells ... read down the cumulative rates for conversion from a 1x buyer to a 2x buyer. 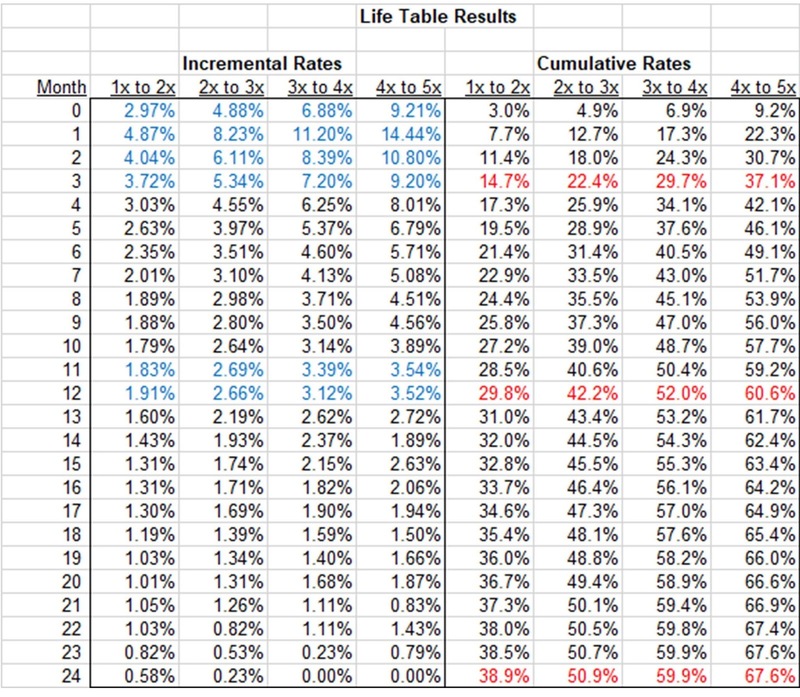 What are the cumulative rebuy rates at 3 months, 12 months, and 24 months? Ok, we're going to run a little experiment here. Let's say that we implement a "Welcome Program" and for months 0/1/2/3 incremental rebuy rates increase by a whopping 20% (which is achievable). 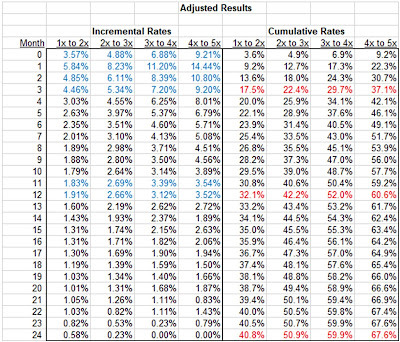 What do cumulative rates look like if we do that? 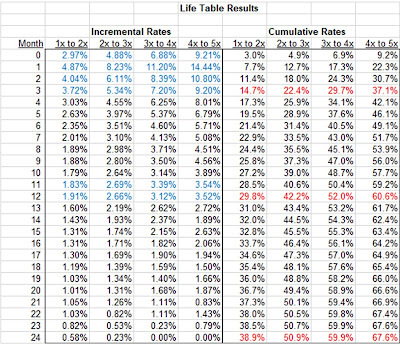 Here are the cumulative rebuy rates at 3 months, 12 months, and 24 months. 3 Month Gain = 17.5% vs. 14.7% = 2.8% points, increase of 19.4%. 12 Month Gain = 32.1% vs. 29.8% = 2.2% points, increase of 7.7%. 24 Month Gain = 40.8% vs. 38.9%, 0.9% points, increase of 4.9%. 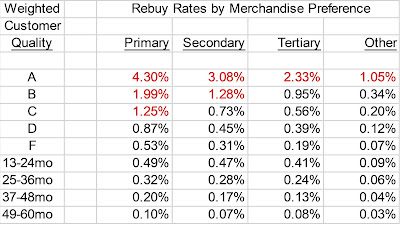 A professional recently asked me "Can I fundamentally increase rebuy rates?" My answer is generally "no", and the person asking the question typically looks at me like I'm a moron. Well, there's a reason you can't fundamentally increase rebuy rates ... and that reason is math. You run the Welcome Program because you hit the customer when s/he is responsive ... you push the customer into higher frequency segments faster. 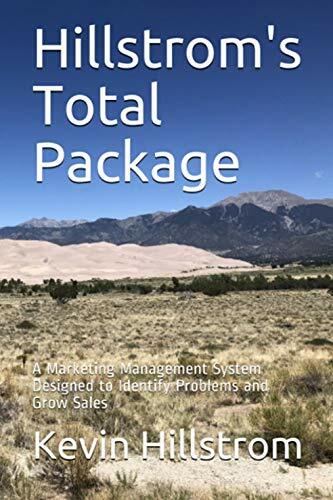 But having done that, you don't fundamentally alter the gravity of your business ... the merchandise you offer mostly determines your annual repurchase rate. 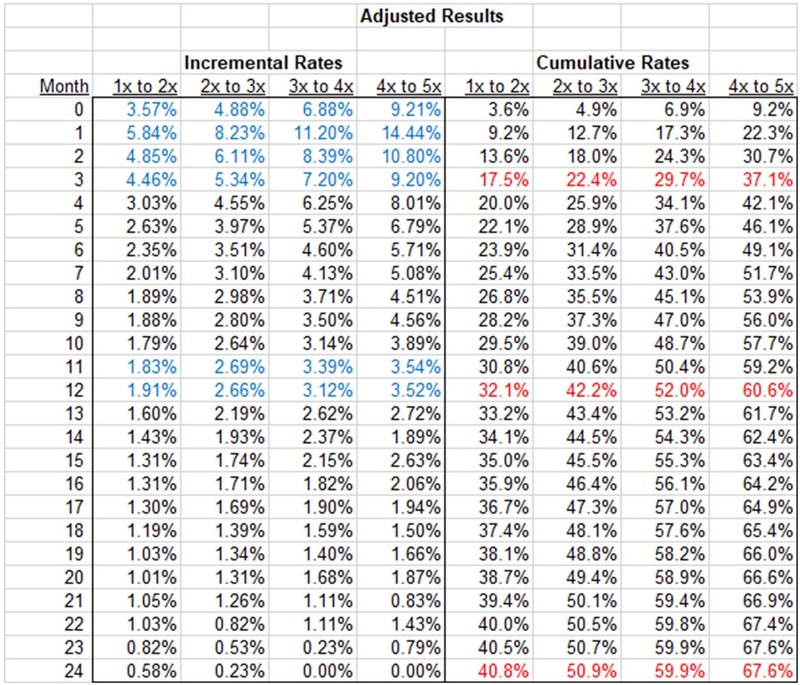 Heck - notice that three straight months of 20% response increases only yield a 19.4% cumulative increase. It's simple math ... math that demonstrates that the merchandise you sell largely dictates your annual repurchase rate. Now that you know that, take advantage of your Welcome and Anniversary programs, enjoy the profit generated by the programs, but don't expect dramatic improvements in annual repurchase rates, ok?